/ Modified apr 10, 2018 2:21 p.m.
View northeast from Arizona Falls along the Arizona Canal toward Camelback Mountain, in Phoenix. Lifeblood of the Desert is a three-part series on how cities in Arizona manage one of the state’s most critical resources, done in collaboration with KAWC in Yuma and KJZZ in Phoenix. 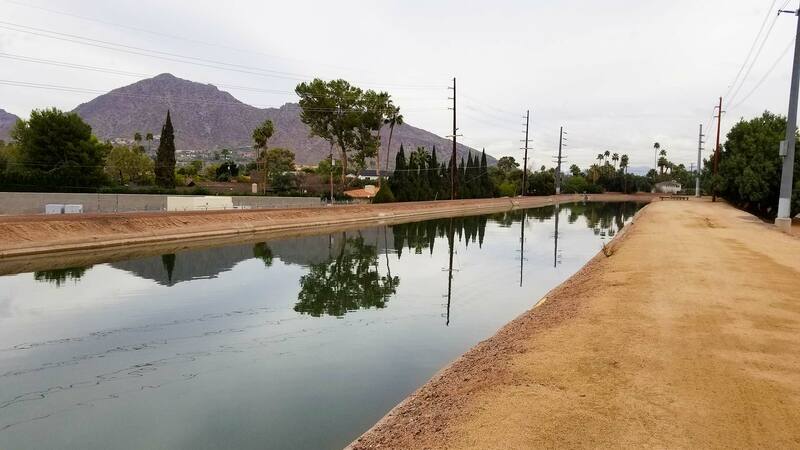 PHOENIX — Maintaining water quality across the Salt River Project’s 131 miles of canals, connected by more than 1,000 miles of lateral ditches and pipes, poses unique technical and workforce problems. “It takes a lot of resources to dispatch individuals, their trucks, the sampling equipment, to a remote location,” said Mike Ploughe, a senior scientist with SRP water quality and waste management services. Ploughe and his colleagues see robots as one way to lessen that burden. 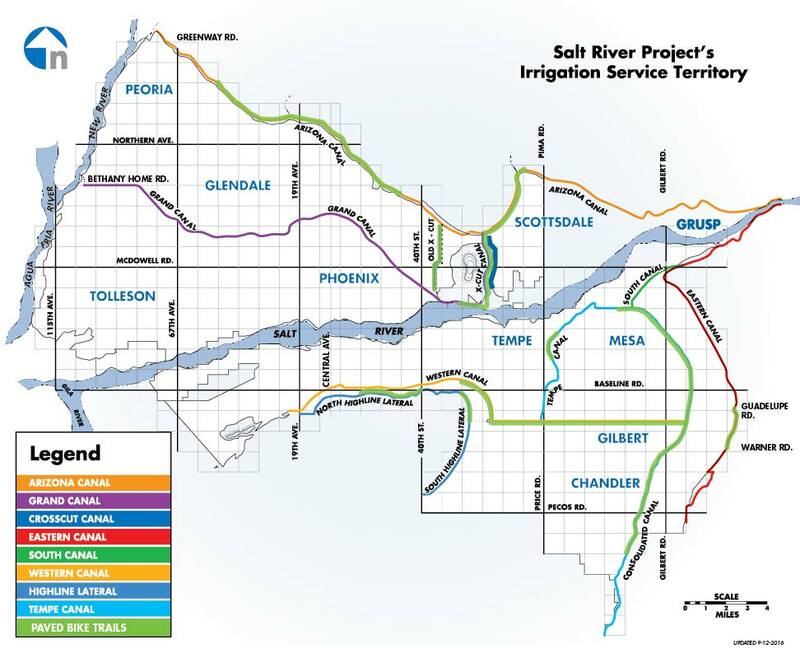 VIEW LARGER Map of the Salt River Project canal network. Beyond handling dirt and debris, SRP uses herbicides — and 50,000 sterile white amur Asian carp (Ctenopharyngodon idella) — to curtail algae and sago pondweed in open canals. But narrow lateral pipes, often choked with invasive quagga mussels, pose a tougher challenge. “[If] we can run a device through there that would go in and remove those — either scrape it off or crush the shell — and move through that pipe, then that would be a real advantage for us at this point,” said Brian Moorhead, an environmental scientist with SRP’s groundwater division. So, robot-wise, SRP needs both an air force and a navy. 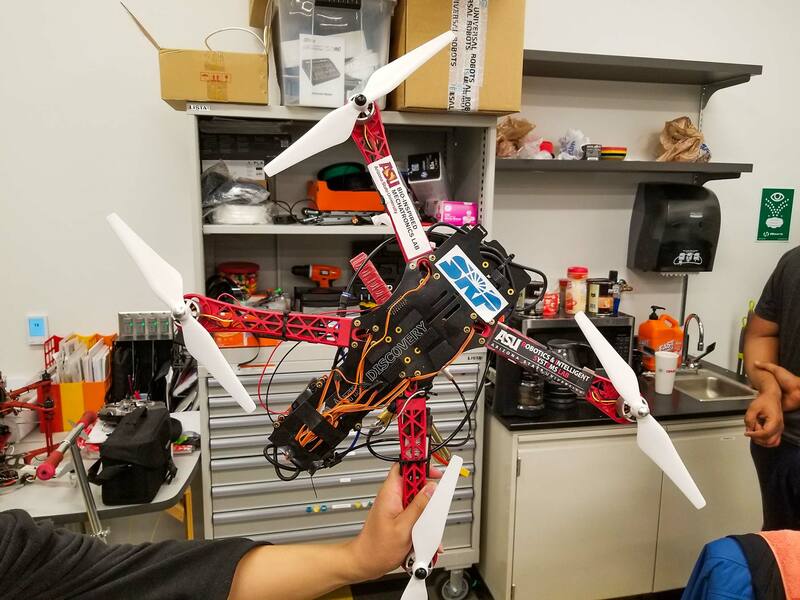 Assistant professor Wenlong Zhang and his team from Arizona State University’s Robotics and Intelligent SystEms (RISE) Laboratory are working on the former: A quadcopter that will fly itself to assigned locations, observe and await orders from operators. A three-part series on how cities in Arizona manage one of the state’s most critical resources. Part I: Santa Cruz River Restoration Brings New Life to Waterway Part 2: Salt River Project Team Turns to ASU Robots to Maintain Canals Part 3: Can Technology Solve Yuma's Water Woes? Sampling might involve an onboard syringe or, for larger objects, a lightweight flexible grasper designed by Zhang’s research partner, soft robotics expert Panagiotis Polygerinos, who leads ASU’s Bio-Inspired Mechatronics Lab. VIEW LARGER The quad copter under development in Wenlong Zhang’s Robotics and Intelligent SystEms (RISE) Laboratory (top view). In place of costly, heavy and rigid motors or gears, the grasper’s “fingers” rely on their segmented shape – and stiff or flexible areas – to curl when inflated. Engineers call such built-in behaviors mechanical programming of materials. Once an SRP engineer — or, eventually, an onboard artificial intelligence — selects an object for sampling or retrieval, Zhang’s drone will use advanced object recognition and self-piloting abilities to hover itself down to the target and get to work. “Now the soft graspers, they will just go over the object, they will just start closing and conforming their fingers around whatever object that might be,” said Polygerinos. Zhang explained that hard robotics require exacting standards, clearly defined before a single part is cut, whereas soft robotics permit looser tolerances and let the user create as many parts as needed, cheaply. 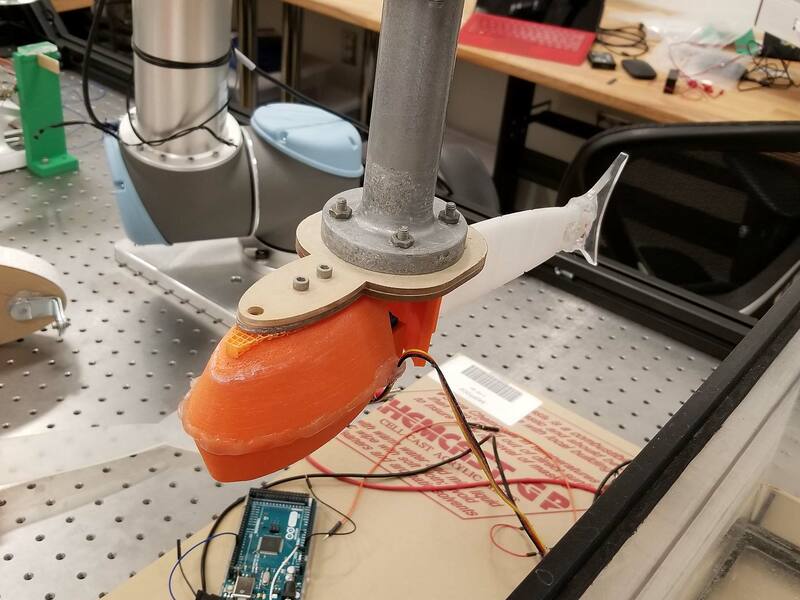 Soft robots also better mimic nature, so ASU assistant professor Dan Aukes and his IDEAlab (Integrating Design, Engineering and Analysis) use them in the fins of their robotic fish, which SRP hopes to use in its smaller lateral pipes. Cheap, flexible materials let Aukes’s lab replace months of complex fluid dynamics calculations with rapidly built prototypes. “If you can make something quickly, throw it in the water and get a sense of how it works, that’s an end-run around the slow development process that you see in a typical research project,” said Aukes. VIEW LARGER Testing the fish-bot involves mounting it on a robot arm. Higher on the assembly, a sensor array records forces acting on the robot. Mohammad Sharifzadeh, a doctoral student in ASU’s systems engineering program who works on the fish-bot, sees another advantage of building economically. Sharifzadeh said an SRP worker warned him that canal walkers might do just that. These humble considerations overshadow the startling ambition these projects represent. Both robots require solving some of the most intricate problems in robotics — including object recognition, autonomy, navigation, flight, machine learning — for a variety of environs and missions, using minimal energy and limited computing power. If they can crack those problems, then, in terms of potential applications, the sky’s the limit. “My goal is to work on those high-level autonomy algorithms that would allow the UAV to sort of work autonomously, fly autonomously without too many human interactions,” said Zhang. Both teams share this vision, and both are considering how their robots might one day coordinate in swarms or schools — or a combination of both — to achieve larger goals. Ploughe envisions one day blending the two projects with others as part of a larger, more comprehensive system. “That’s where a lot of innovation can be found, is bringing things together that you wouldn’t otherwise try to do,” he said. Whether or not SRP funding continues to flow after contracts end this summer, there’s little doubt these teams have contributed to the latest wave of robotics research, a rising tide that will lift all bots. Lifeblood of the Desert is a three-part series on how cities in Arizona manage one of the state’s most critical resources: water. See more from this series.